A black and white large format negative of the Townsend baby taken on November 24, 1947. In this view the baby is looking at the camera. This negative has started to degrade. 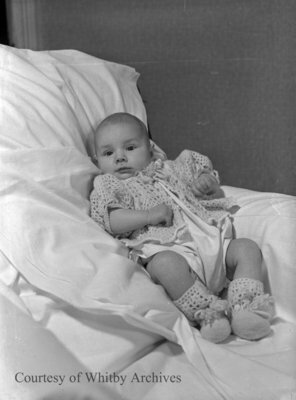 Townsend Baby, November 24, 1947, Marjorie Ruddy. Whitby Archives A2013_040_467.